Society has made us dependent on items produced to last forever, but designed to be disposable. The most tangible symbol of our ‘throw away’ culture is a plastic straw we only use for few seconds but never degrades. An estimated 7.5 million plastic straws are currently polluting US shorelines, and anywhere from 437 million to 8.3 billion plastic straws are on shorelines around the world. Biostraw4planet aims to establish the sustainable production of biodegradable alternatives to plastic straws, starting with a bamboo straw. 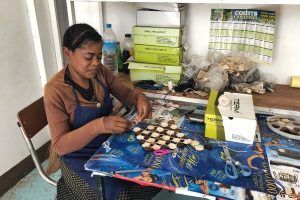 This will be done via jobs creation for disabled people in the island of Rodrigues in the Indian Ocean, which has one of the world’s five plastic islands. Biostraw4planet will allow you to enjoy a drink without damage to yourself and the environment. Biostraw4planet will create straws that are reusable, antibacterial and help reduce waste. We foresee educational actions through social campaigns, events and documentaries to promote this solution. Making biostraws from bamboo in Rodrigues. The Biostraw4planet project contributes to UN 2030 Agenda: ocean preservation, equal education, employment and remuneration for discriminated people, and sustainable management of forestry. BioStraw4Planet will transform waste into a valuable resource according to the principles of the circular economy. Bamboo is one of the most sustainable plants in the planet because it consumes little water, absorbs carbon dioxide and releases 35% more oxygen into the atmosphere. Thus, using bamboo straws will not only help reduce plastic usage in the island of Rodrigues, it will also diminish one significant source of plastic feeding the plastic island of the Indian Ocean. Forecast say that up to one million plastic straws will be replaced in 2020/21 (+ Mauritius, Seychelles, Maldives). Building awareness about plastic pollution from a scientific perspective. It is estimated that two million plastic straws will be replaced by organic biodegradable alternatives by 2030 (in the island). There will be an increasing demand on biodegradable and organic solutions in the next future. Several countries have already enforced the single-use plastic ban, and the European Parliament has recently voted for a complete ban on a range of single-use plastics across the union in a bid to stop pollution of the oceans, including straws by 2021. Every year, over 36 billion straws are used and thrown away in the European Union alone, therefore the potential goes well beyond the above forecast.